News Corp: Divide and conquer? 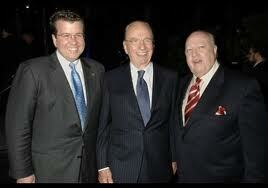 No doubt, Rupert Murdoch has something up his sleeve. His News Corp. has announced plans to divide into two new companies — one involved in print activities (mainly publishing the more than 100 newspapers in Australia, Great Britain, and the US) and another one involved in the far more lucrative activity of broadcasting. Like many people, I suspect that Murdoch is seeking to protect the value of the broadcasting companies by separating them from his troubled print operations, which are the target of the phone-hacking scandal in the U.K. (and which threaten to drag the company into a parallel scandal here in the U.S. before too long). In an interview with the pompous windbag Neil Cavuto on Fox News yesterday, the inscrutably inarticulate Murdoch said he had no goal other than to improve both companies by letting their talented managers do their best. Yeah, right. Stay tuned (but not to Cavuto). My bet? He spins it off and takes the publishing private. Excellent theory. The papers are his sentimental favorites, and no one else probably wants them anyway. He can then give the newspapers to whichever child he likes the least!